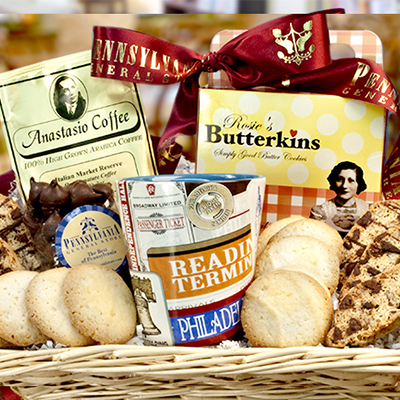 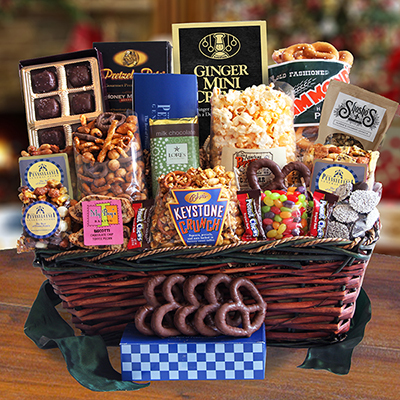 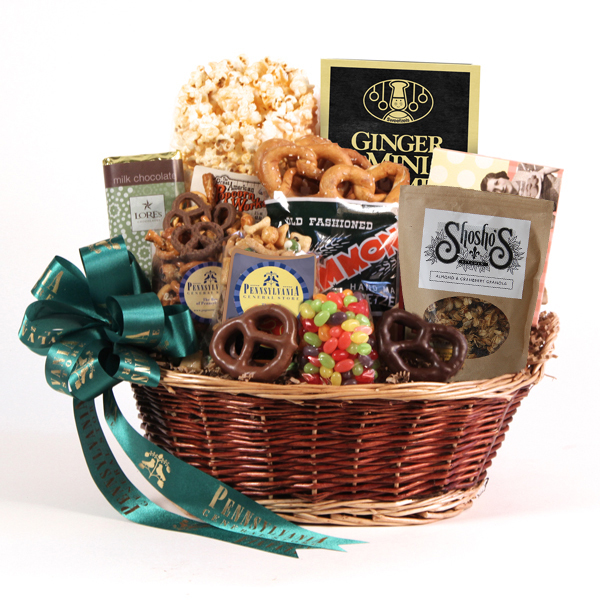 Choose from the wide selection of gourmet gift baskets offered by the Pennsylvania General Store. 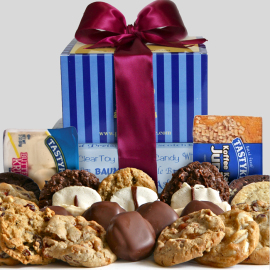 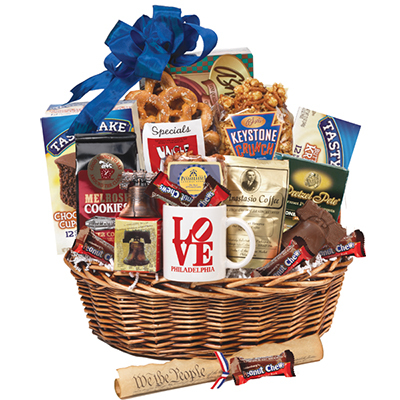 You can find lovely food gift baskets for any occasion from birthdays to anniversaries, holidays to reunions. 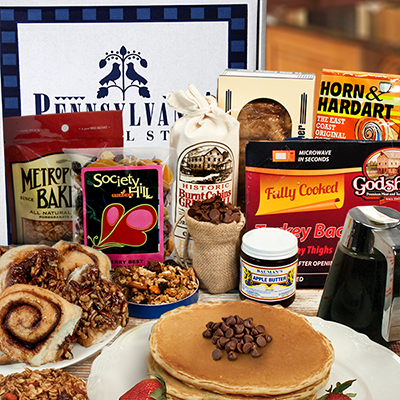 Each of these Pennsylvania gifts is unique, filled with gourmet delights from this historic state. 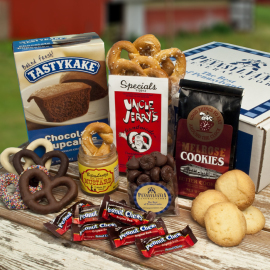 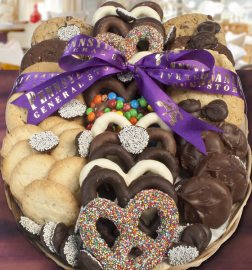 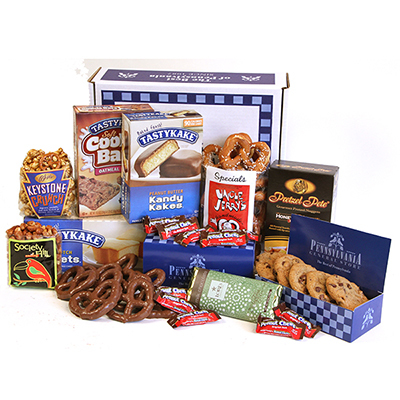 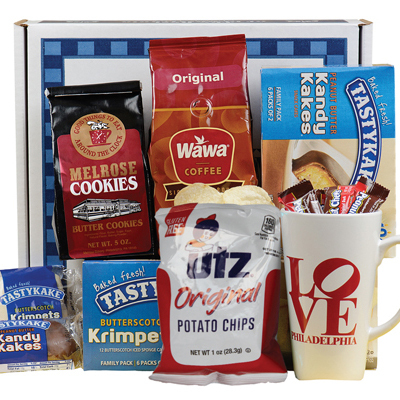 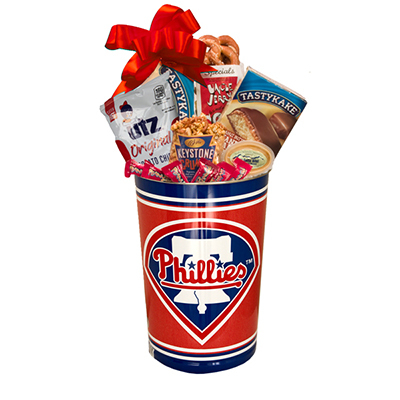 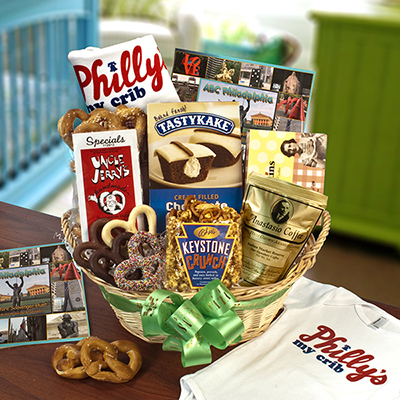 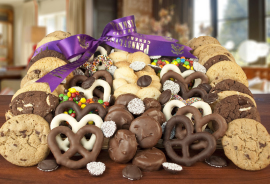 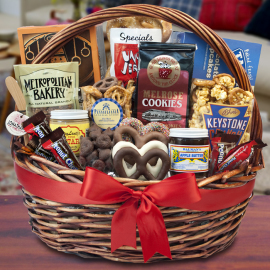 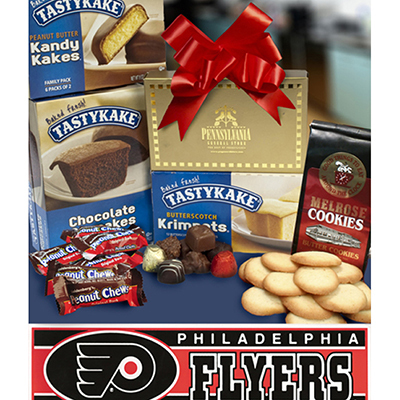 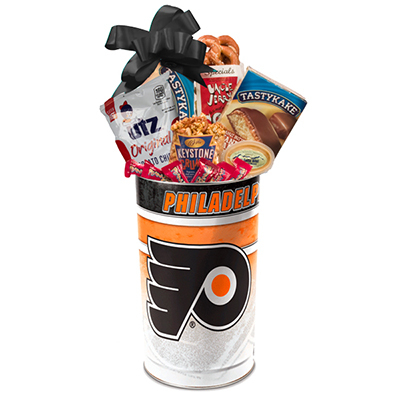 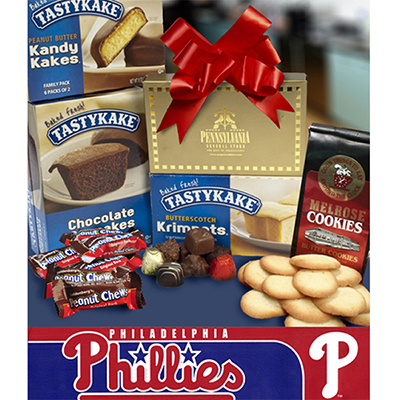 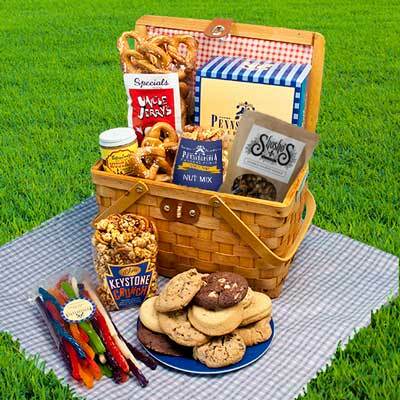 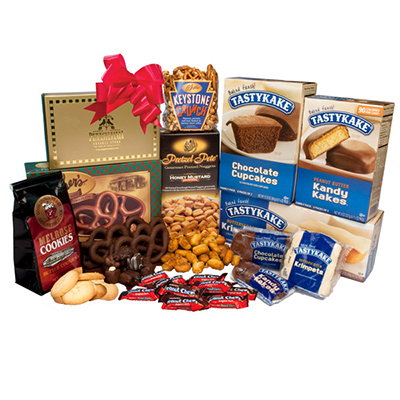 Philadelphia gift baskets include specialty items such as Tastykake cupcakes, Pretzel Pete's Honey Mustard, Liberty Bell gifts, Asher's Chocolate Covered Pretzels, Philadelphia mugs, Goldenberg Peanut Chews, Hope's Cookies, Pennsylvania Dutch Licorice and many more Pennsylvania treats. 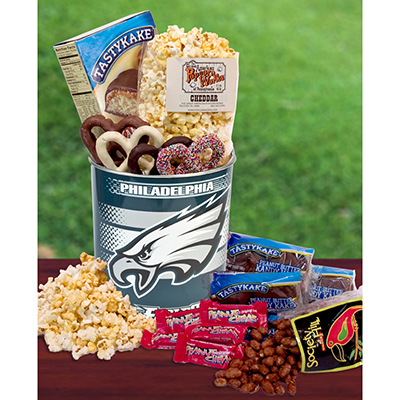 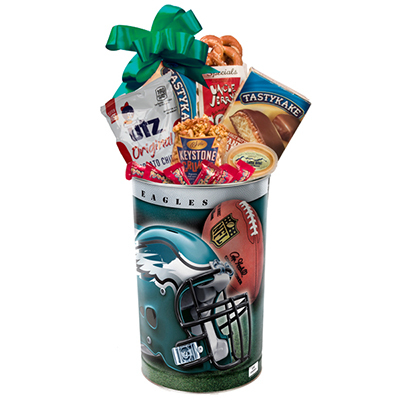 For sports fans, there are several delightful gourmet gift baskets filled with sports gifts from favorite teams including the Philadelphia Phillies, Philadelphia Eagles, Philadelphia Flyers and Penn State Nittany Lions. 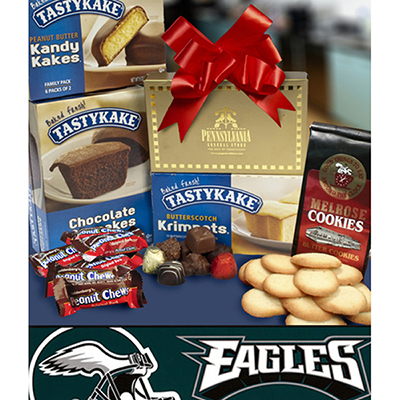 Pair gifts from the sports teams with favored treats to eat while watching their games. 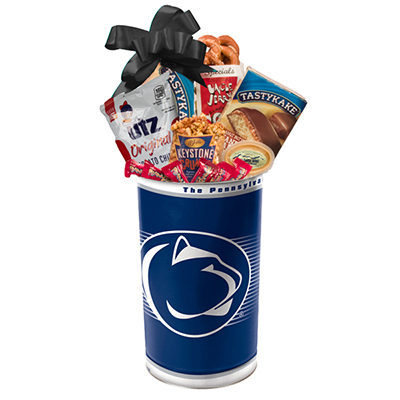 Great gift ideas for college students, these gourmet gift baskets can be ordered packed inside official logo wastebaskets. 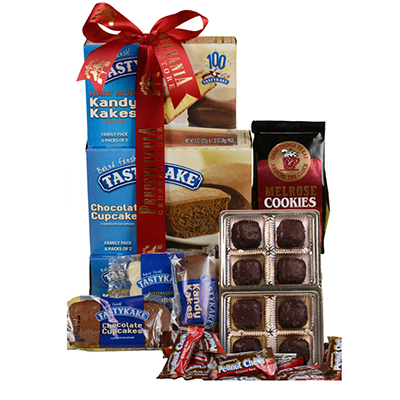 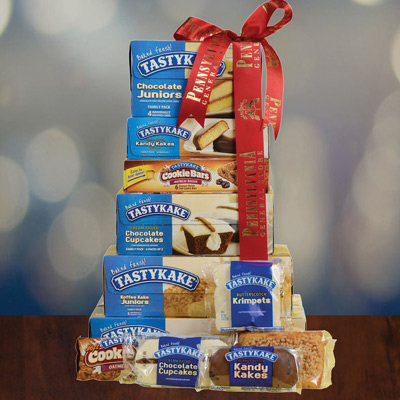 For those who grew up in the great state of Pennsylvania, these Pennsylvania gifts bring back memories of sweet summer days sharing Tastykake Cream-Filled Chocolate Cupcakes and Peanut Butter Kandy Kakes with childhood friends, siblings and schoolmates. 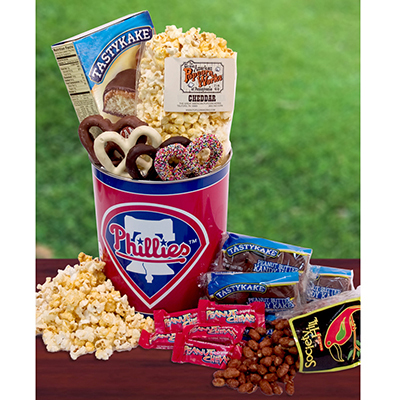 Give a Philadelphia gift basket to someone you love for an anniversary or special birthday to relive those days together and enjoy delicious cakes. 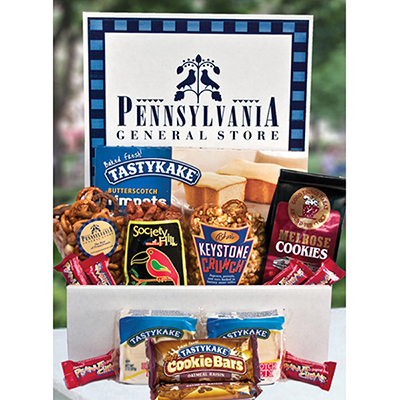 If you are giving a party at home or celebrating at the office, Pennsylvania gifts are the perfect addition. 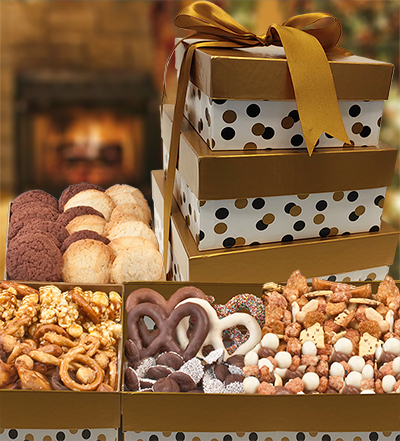 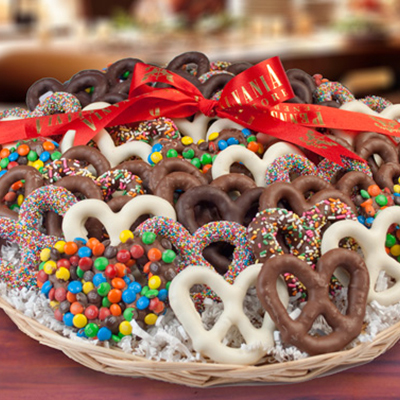 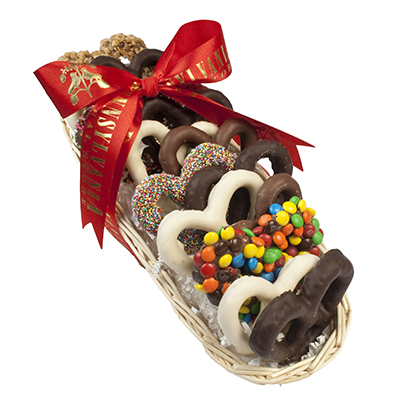 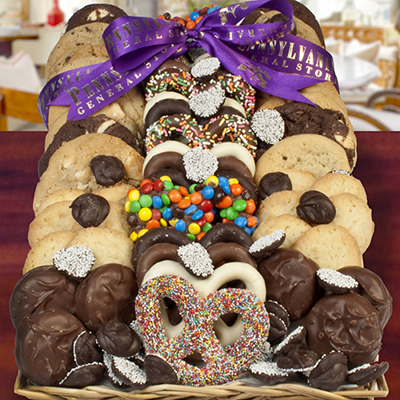 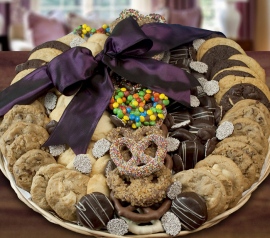 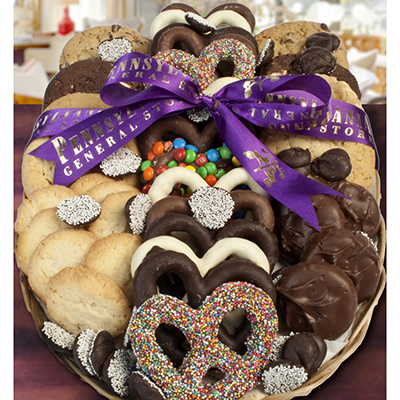 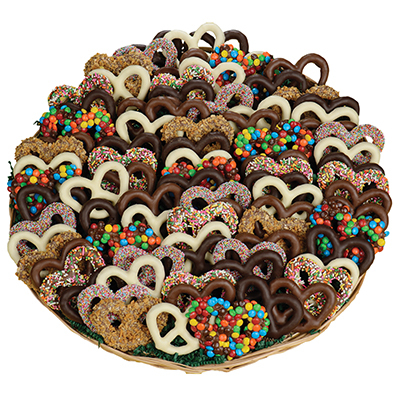 Order Chocolate Pretzel Trays for any number of guests ready to serve. 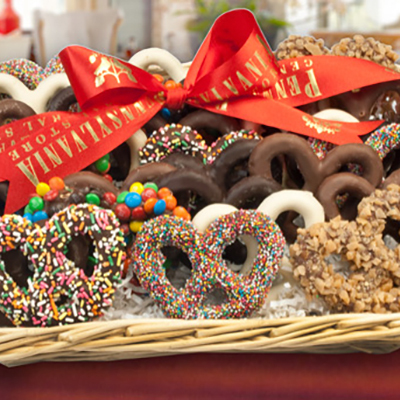 Each tray comes filled with a variety of pretzel flavors artfully arranged on a wicker tray. 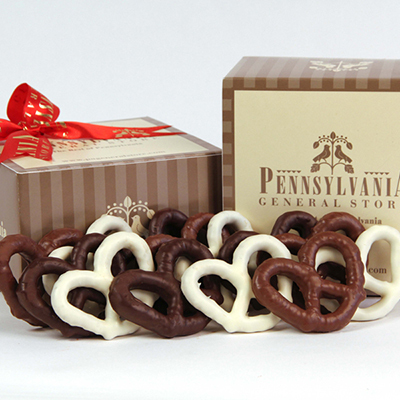 Guests will love the delicious salty-sweet pretzels. 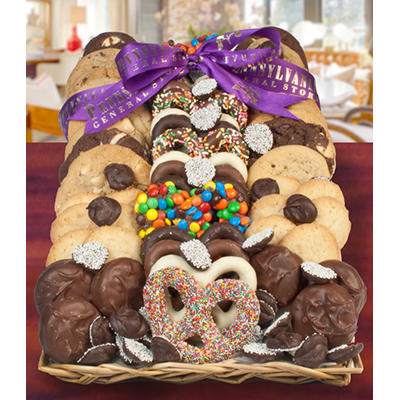 Other Goody Trays perfect for family reunions include a mixture of goodies including Chocolate Pretzels, Hope's Cookies, Chocolate Covered Oreos and Dark Chocolate Nonpareils. 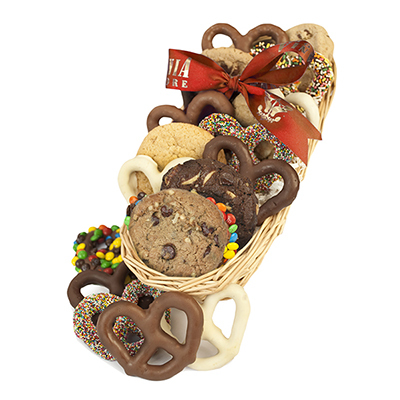 Order and ship these to friends and family or ship them to yourself to deliver. 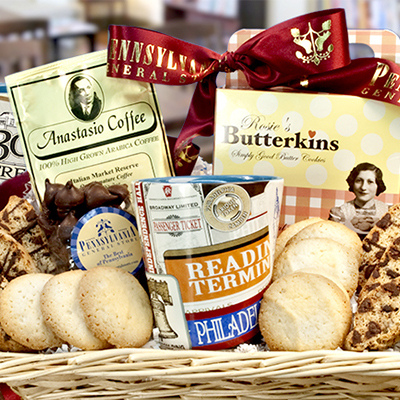 For the one-of-a-kind taste of Pennsylvania, try gifts such as Chocolate Scrapple, Salt Water Taffy, Melrose Butter Cookies, Koffee Kake Juniors, Bauman's Apple Butter and My Boys Baking Chocolate Chip Toffee Pecan Biscotti. 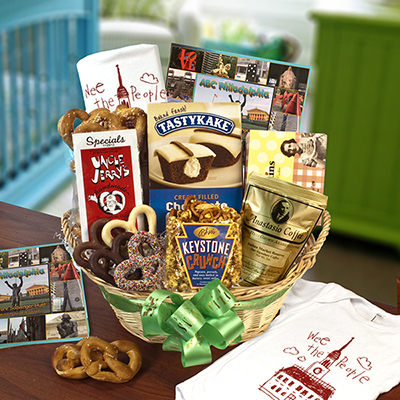 Or browse through the list of Philadelphia gift baskets to choose your favorite treats from the Keystone State. 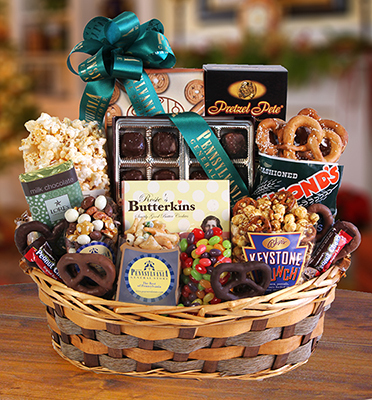 You will find affordable gifts that your friends and family will love although it might be hard to convince them to share.